The small-town feel of Bentonville belies the corporate energy of Wal-Mart's International Headquarters located near the heart of the city. Established in 1836 as the first county seat in the state of Arkansas, Bentonville has maintained the historic character of the town. Within the city limits, there are 72 historical buildings and homes, including the Peel House Mansion and Historical Gardens. 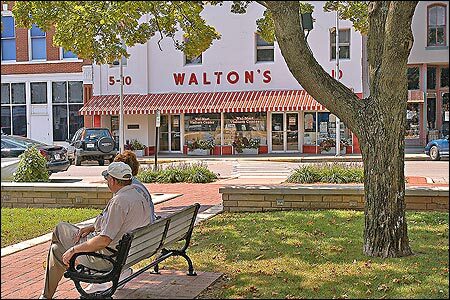 The Bentonville town square embraces a Civil War statue, benches, fountain, and beautiful gardens surrounded by quaint shops, and the Wal-Mart Visitors Center, Sam Walton's original variety store which now traces the origin and growth of Wal-Mart. Nearby Bella Vista has seven championship-quality golf courses featuring 117 holes of golf, and there's a combination of five more public and private golf courses in Benton County. Water sports and camping are popular at nearby Beaver Lake. Bentonville is 5 miles from Pea Ridge National Military Park, 19 miles from Hobbs State Park-Conservation Area, and 38 miles from Eureka Springs. The Fayetteville square is known for its beautiful gardens and Farmer's Market that runs three days a week beginning in Spring and ending in early autumn. Just blocks away, Dickson Street is the hip place for unique shops, dining locales, and tons of live music venues. Completing the scene are the symphony concerts at the Walton Arts Center, which also brings Broadway shows, drama, and dance to the city's entertainment district. Fayetteville is also rich in Civil War history with the National and Confederate cemeteries and Headquarters House. Hiking and mountain bike trails are abundant within the city and surrounding Ozark region, including Lake Wedington, White Rock Recreation Area, Ozark Highlands Trail and Devil's Den State Park. Outdoor enthusiasts also enjoy nearby camping, horseback riding and caving opportunities. Rivers in the area that are popular for fishing and floating are the White, Kings and Mulberry. Home to the University of Arkansas, the state's major research and flagship education institution, and located off of Interstate 540, Fayetteville is 58 miles from Eureka Springs, 60 miles from the Buffalo National River, and 63 miles from Fort Smith. A great place to comb antique stores or catch a ride on the Arkansas and Missouri Railroad in a beautifully restored turn-of-the-century passenger car, downtown Springdale is also home to the Shiloh Museum, which offers Ozark history and buildings dating back to the 1850s. Two other elements identify the essence of Springdale - the annual Rodeo of the Ozarks, held July 1-July 4, and the award-winning, world-famous AQ Chicken House restaurant. It opened on July 20, 1947, and has become family tradition. Signaling the growth of the city is Ozark Center Point Place near Interstate 540. 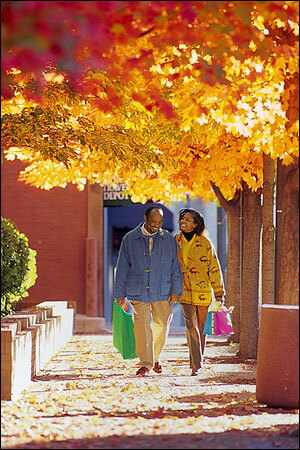 This 269,500-square-foot outlet mall contains over 30 specialty and discount stores of popular name-brand goods. Springdale too lays claim to the treasure of nearby Beaver Lake for outdoor activities and is close to numerous rivers popular with canoeists, including the Mulberry, Kings and Buffalo. Hiking, caving, and camping is available at nearby Devil's Den State Park and Withrow Springs State Park, both less than one hour away. The city is about 22 miles from Prairie Grove Battlefield State Park, and 41 miles from Eureka Springs.